Habitat For Humanity is a non-profit, ecumenical Christian housing organisation building simple, decent, affordable housing in partnership with people in need. I have a number of friends and colleagues who have volunteered to travel overseas and assist with building projects for people in need – great job by them I say. Compass on ABC TV recently had a show on one of these builds in which two friends participated – click here to see the show (probably only viewable in Australia unfortunately). I learned to drive in a Volkswagen, all those years ago. It was one of the old VW bugs, in fact the first of the models released in Australia with the curved, instead of the straight windscreen. They were funny days, in hindsight, trying to master a handbrake start on a slight hill at Merrimac, behind the Gold Coast (although it’s probably an integral part of the Gold Coast now). And seeing the look on my father’s face when I mounted the gutter and ended up on the footpath at the end of our street, thankfully pulling up before we slid down into Boobegan Creek. For a time, when Dad was out of work, our family of six was a single car family, with the VW being the single car. It would certainly by frowned on by the constabulary now, probably was then too. But I can confirm that the luggage compartment behind the back seat was the perfect size for a small child. Do you remember that, Ian? I’ve owned one VW prior to the Golf, a VW Bora (now called the Jetta), which I thoroughly loved, and I traded in for a Citroen CX3, which was a piece of crap. But that’s another story. 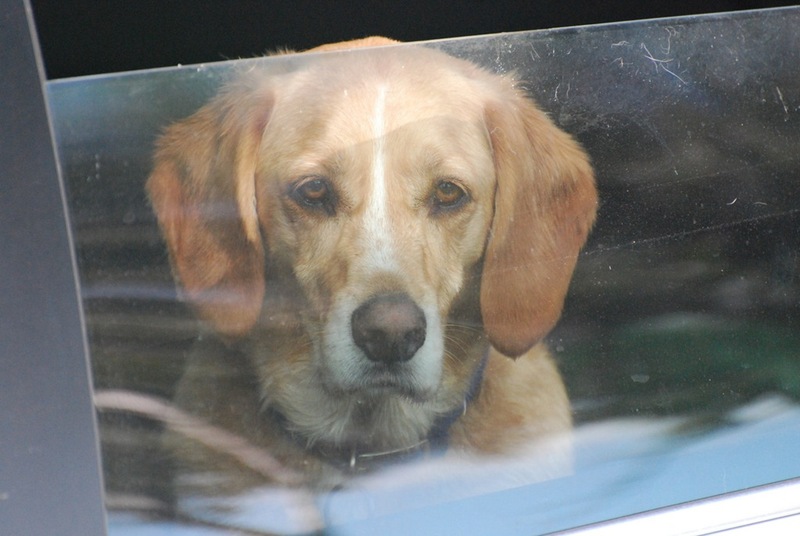 This time around (October 2010), I was in the market for a mid-sized station wagon, because I have two large dogs that need to be transported from time to time. On that subject, you should have seen me when I was trying to transport them in the CX3. I already had a Holden Astra Wagon, which was doing an OK job, but I’d decided to head up market a little bit. What were my buying criteria? The ultimate question. Would you buy another one? It was probably that single conversation that persuaded me to head down the Golf path. So what do I have? It’s a silver 2010 Volkswagen Golf 103TDI Comfortline (http://www.volkswagen.com.au/en/models/golf_wagon/variants.html). Which basically means it’s the top-of-the-line with regard to appointments, with a 2.0 litre diesel engine and 6-speed automatic gearbox. All my buying criteria were met, the latter two by after-market addons. So what do I think after 8 months? Absolutely love it. Firstly, I just can’t believe how much grunt I get out of the 2.0 litre diesel. It really makes me wonder how quick the smaller, lighter hatch would be with the same engine. I still, even after eight months, struggle with the Direct Shift Gearbox a bit. While it is an automatic transmission, it is a bit like a manual that’s being controlled automatically. Funny way of describing it, I know, but hey, I’m not a mechanic. It struggles a bit in that black spot between 1st and 2nd that those who drive manuals will relate to – while moving, do I put it into first with a big lurch and over-revving or second with low revs and ride the clutch? It’s a bit slow on the pickup when one needs to change down in a hurry as well. There is just something about German cars though. A bit spartan perhaps, but absolutely rock solid and great engineering. It’s amazing the number of people who have commented on the solid “thunk” of the doors as they close. The economy is fantastic – I’m averaging 5.9 litres per 100 kilometres around town. I find that if I shop around, generally using www.motormouth.com.au, I can get diesel for about the same price as unleaded, so there is definitely a saving in that regard. There have been a couple of dramas along the way. The phone kit packed it in after a couple of weeks and I had to get it completely replaced. On top of that, when the transfer of registration came through from VicRoads, it was for the wrong registration number. The error wasn’t picked up for six months after I bought the car and now, two months later, I’m still trying to get it sorted out. I suspect the fault lies with VicRoads, rather than Camberwell VW, where I bought the car. In fact, as an aside, the folks at Camberwell VW were great and I would definitely recommend them. I thought the new owners’ seminar was a great touch. So, in short, I really look forward to driving my car every day, and would thoroughly recommend the Golf. I’m guessing that, having jumped around all over the place (Austin / Toyota / Mazda (x2) / Ford / Saab / VW (x2) / Citroen / Holden), I’m now solidly in the VW camp for good. And thankfully, I haven’t come close to driving it into a creek. A big three cheers to all the volunteers from Warragul SES and the Lions Club for their manning of the Driver Reviver post at Longwarry North today. An excellent service for all of us travelling back from Gippsland – managed extremely well and in a very friendly manner. I’ve blogged before about the importance of our dogs, Spike and Ned, to Carol and me. They are an integral part of our lives, so when we decided to go away for Easter, it had to be somewhere that they could come as well. We found Eagle Point Cottages on the net (http://www.gippslandlakesaccommodation.com/), about three and a quarter hours drive from Melbourne in East Gippsland. Well it would normally be that, if the freeway wasn’t closed at Morwell. Add an hour. Thanks VicRoads. 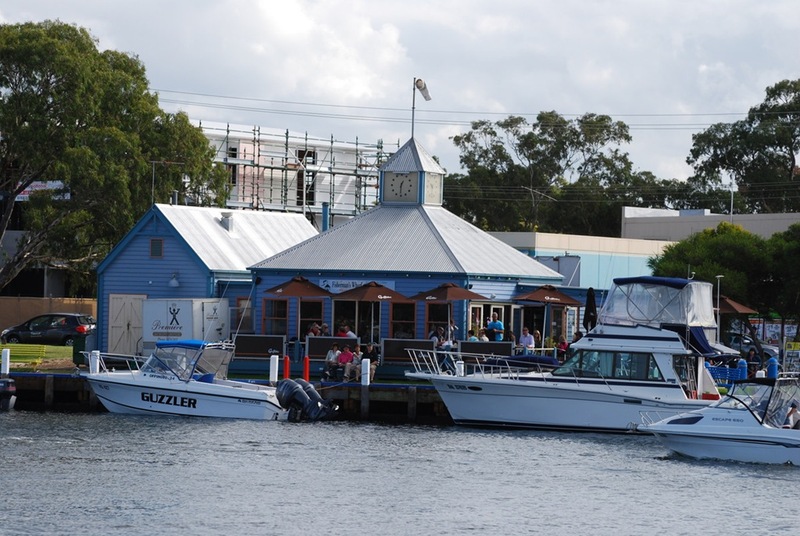 We discussed the usual concerns when we’ve thought about going to East Gippsland in the past. It’s just a bit too far. Ned doesn’t travel well. Everyone says the mosquitoes are shocking. We put all that aside and booked anyway and are so glad we did, for two reasons. We had a fantastic time and also made one of those life-defining decisions while we were there. There are two cottages comprising Eagle Point Cottages, set on an extremely large area of mowed lawns and native trees, surrounded by farmland. The eagle and pelicans flying overhead at different stages were stunning and there was a plethora of native birds as well, given all the trees. There were no concerns about letting the boys off the leads to run around, given the size of the property and the distance from the road. However they also had their fenced-in back yard. The cottage was described as a studio, which I guess means the bed isn’t in a separate bedroom. It had everything we needed, was clean and extremely comfortable. Phil, the owner, dropped over briefly to make sure everything was OK on our first morning, but beyond that, we were left completely to ourselves. I really like that. For those of you who don’t know and haven’t bothered to look at a map since you started reading this, Eagle Point is about seven or eight minutes drive from Paynesville, described as the Victorian Riviera. 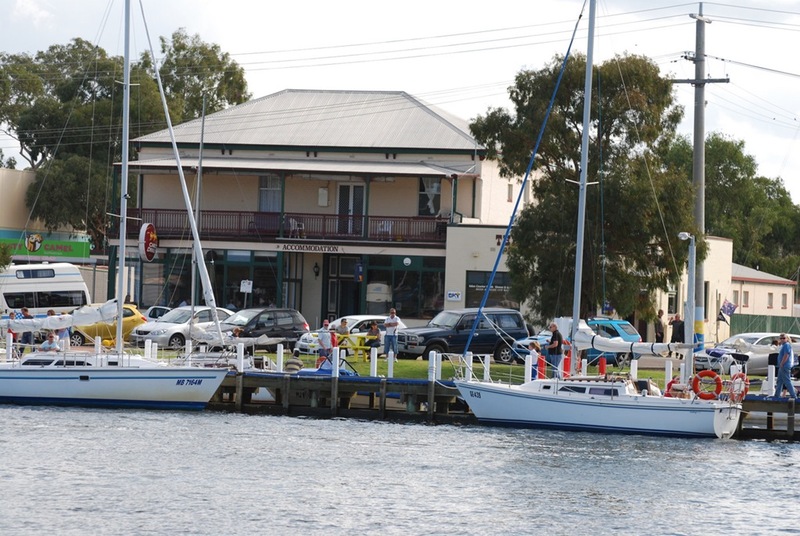 If Paynesville isn’t ringing any bells, it’s about 20 minutes from Bairnsdale. If you’re still looking blankly, look at a map. “Oh give me a spell” was my reaction when I first heard the Victorian Riviera bit. “What wanker real estate agent came up with that?”. But damn it, it’s pretty close to the mark, albeit nowhere near as pretentious as the French Riviera or more locally, Sorrento, to which we found ourselves making a comparison. We (and Spike and Ned) absolutely loved the place. It was certainly the most relaxing break either of us could remember having for a very long time. There was lots of running, swimming and walking for the boys and plenty of things to see for u s. The Gippsland Lakes area is absolutely magnificent – I continued to curse myself for leaving it so long to go down there. I used to say that Rutherglen and surrounds was the best part of Victoria. Wrong! We also found more than enough time to curl up with a couple of good books, which usually coincided with two exhausted boys being sound asleep on their beds. So what of the reasons for not going? It probably is a bit too far, but was no doubt worth the pain once we got there. The mosquitoes are a pain in the arse, but nothing that Aerogard can’t fix. And we learnt that Ned goes a bit stir crazy coming down off the valium. While we’re on that subject, why do four valium tablets cost $20 at the vet? That might be the subject of another blog post. So here it is. Carol and I have decided that, when the time comes for us to finally retire, it will be to either Paynesville or Raymond Island. Probably Paynesville – I don’t fancy being completely dependent on a car ferry when there’s a bushfire screaming across the island. Although, at least it’s not operated by VicRoads. 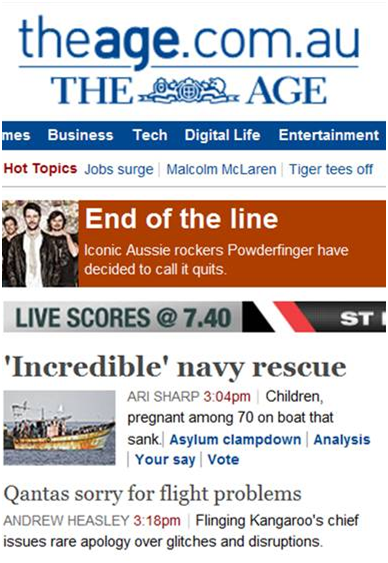 The Age had a story this morning on another Tiger Airways debacle. Why anyone would fly with these clowns is a complete mystery to me. If you dig down into the comments in the article, you’ll find this. Bravo Make A Wish Foundation! That may not come as too much of a surprise to those that know me. I concede I get carried away sometimes with the adverse way I rate Qantas when compared to Virgin Blue, an airline which I consider to be a vastly superior domestic carrier in Australia. However, on this occasion, let me try and strip the emotion away and explain why Virgin Blue is better. The scenario is this. I am scheduled to travel to Perth from Melbourne with Qantas (not my choice) on an Airbus A330. The aircraft on which we are supposed to travel is 40 minutes late arriving from Sydney. Something to get upset about? Not really. After all it is Boxing Day with half of Australia travelling it seems, there is adverse weather all around the country and this particular aircraft originates from Sydney, notorious for causing delays. However, 30 minutes after the revised boarding time for out flight, it is apparent that something isn’t right. 40 minutes after the revised boarding time there is finally an announcement. There is a problem with the flaps on the aircraft and we would be kept informed. Do I have a problem with Qantas being 100% certain the aircraft is airworthy? Absolutely not. Do I have a problem with having to wait 40 minutes to find out what’s going on? Absolutely. Issue 1: Failure to keep the customers informed. To Qantas’s credit, they have done a couple of good things I haven’t seen before. The flight attendants have come into the lounge to hand out drinks, nibbles and ice creams. Also, one of the flight crew is present in the lounge to deal with any customer enquiries. After another period of time (I must admit, I don’t remember how long), we are advised the aircraft is unserviceable and they have arranged a replacement aircraft. This will leave from a lounge at the other end of the terminal at 3:00pm, 2 hours 25 minutes after the original scheduled departure time. We can present our boarding pass at a food outlet to receive a meal to the value of $10 (wow, that gets you a lot at Melbourne airport). We also need to present our boarding passes at the service desk, because there is a change of aircraft, to a Boeing 767 with a different seating configuration. Issue 2: It took around 40 minutes to give everyone (approximately 250 people) a new boarding pass, with the queue stretching a very long way through the terminal. Seriously Qantas, you’ve already screwed people around. Couldn’t you actually plan for these events and organise for some more people to be available? So, having been informed by the Qantas staff members at the service desk that the food voucher was actually $20, off we toddle to get some lunch. Issue 3: The people at the food outlets have been told the voucher value was $10, while the customers have been told it’s $20. Back to the lounge now as we don’t want to miss our 3:00pm departure. At 3:10pm, still sitting in the lounge, it is apparent we are not leaving at 3:00pm. Then there is an announcement from one of the flight crew that, because of the different aircraft type and the delay, catering needs to be re-done for the flight and sourced from the Qantas kitchens. There will be a further delay and we are not expected to leave until 4:30pm, a smidgeon less than four hours later than the original scheduled departure. Issue 4: Why does Qantas get so hung up on feeding people? Even for a 4 hour flight to Perth, surely it’s possible for people to forego feeding their faces. I’ve lost count of the number of times I’ve experienced delays with Qantas because of “catering requirements”. Also, the appalling quality of the food just doesn’t justify the more expensive fare. I don’t care if it’s inspired by Neil Perry. It’s still crap. Issue 5: As a much younger airline, Virgin Blue has the benefit of having one type of aircraft on its major routes, the Boeing 737. Qantas has a mixture of 737s, Airbus and Boeing 767 aircraft. Thus when problems occur, Virgin has much better flexibility to make changes to aircraft with a minimum of inconvenience. In summary, you’re always going to get emotional, almost religious wars, about which is the better airline. Customer service, good or bad, is pretty subjective. Did they smile at me? Did they keep me informed? Was the captain there to wave me goodbye as I left the aircraft? But when considering Issues 4 and 5 above, there is no good reason why you would seriously consider flying Qantas domestically in Australia. It’s dearer than the competition (generally speaking), its customer service is choppy, and operationally, it is in a much worse position than the competition to react to unexpected events. 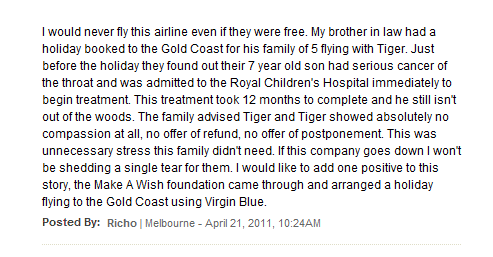 And that’s mainly why I choose to fly Virgin. And they smile!